My latest project, the Desktop Light Sculpture, is a digitally fabricated object featuring a 3D-printed base and laser-etched acrylic inserts. Inside the base you can find a neopixel matrix, a Qduino Mini, and a few other basic electronic components for usability. 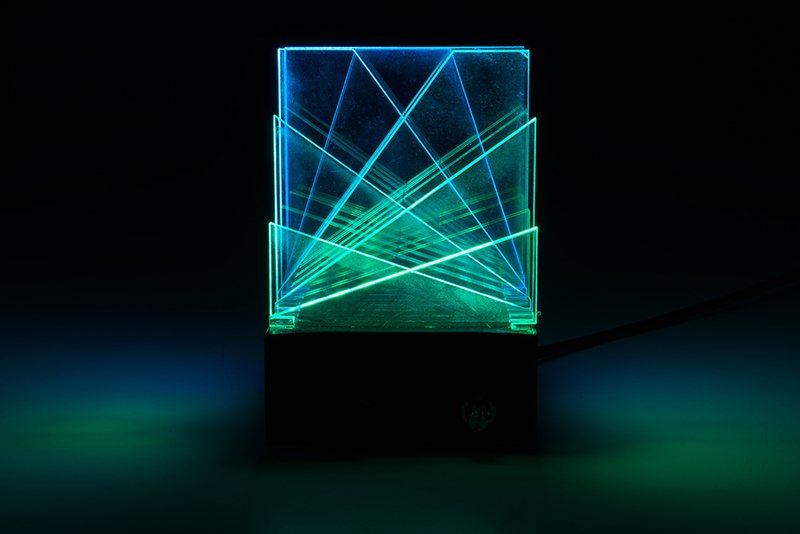 The idea for this project is dependent on edge-lighting the acrylic. What this means is that when light is applied to the edge of a piece of acrylic, it will be picked up by any etched parts on the surface of the plastic as well as along its edges. This creates a beautiful visual effect! 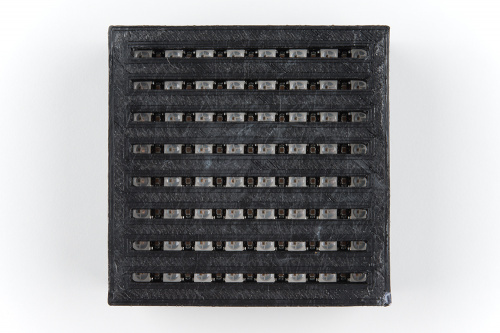 The major element of this project is definitely the digital fabrication. I really love that there are two parts to design that have very different design constraints. 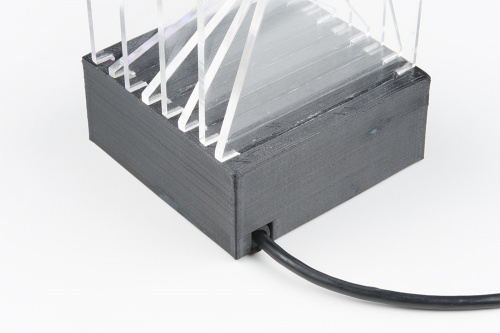 The first, the 3D-printed base, needs to be designed to fit the electronic parts, hold the acrylic, and separate the light from each row of LEDs (as to not affect a neighboring piece of acrylic). The parameters offer a good design engineering challenge, but offer less in the way of creativity. The second part, our acrylic inserts, must fit into the slot in the base, but otherwise offer complete creative freedom. They can be any shape or size and feature any etched design. 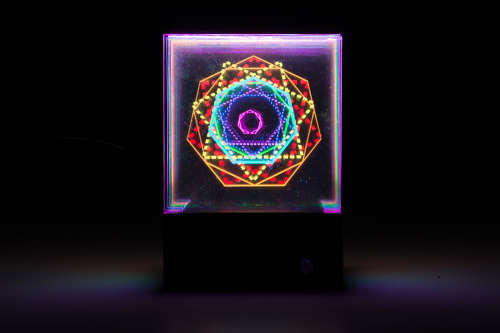 With endless colors, patterns, and animations to program your LEDs, the design possibilities of this project are endless! 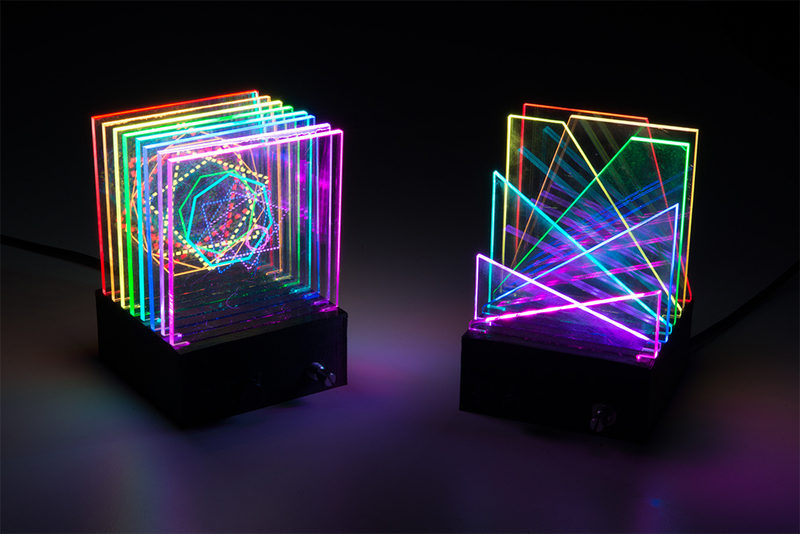 If you would like to make this project at home, you can grab everything you need from my Light Sculpture Wishlist. Both the .stl for the 3D-printed base and the Illustrator file for the acrylic insert shape can be found on thingiverse. The images below illustrate how the parts fit into the base. You will notice that in addition to the LEDs and microcontroller, the project features a button, a switch and a potentiometer. 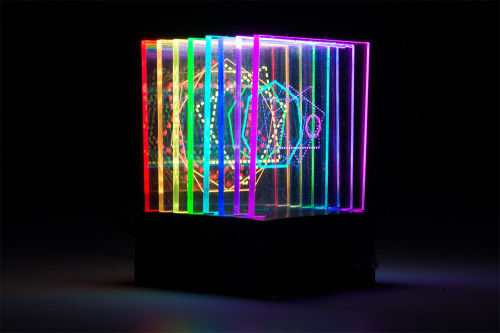 The button is used to cycle through different LED colors, patterns and animations. 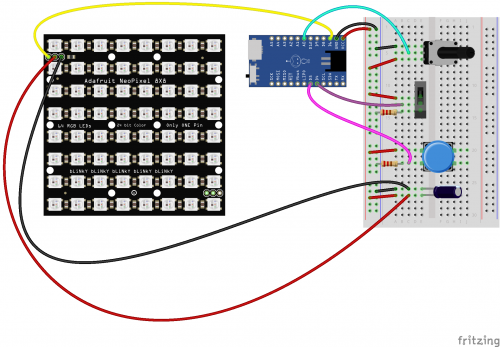 The switch will turn the project on or off, and the potentiometer controls the brightness of your LEDs. The diagram below illustrates the circuit used in this project. Below is the program I used for this project. 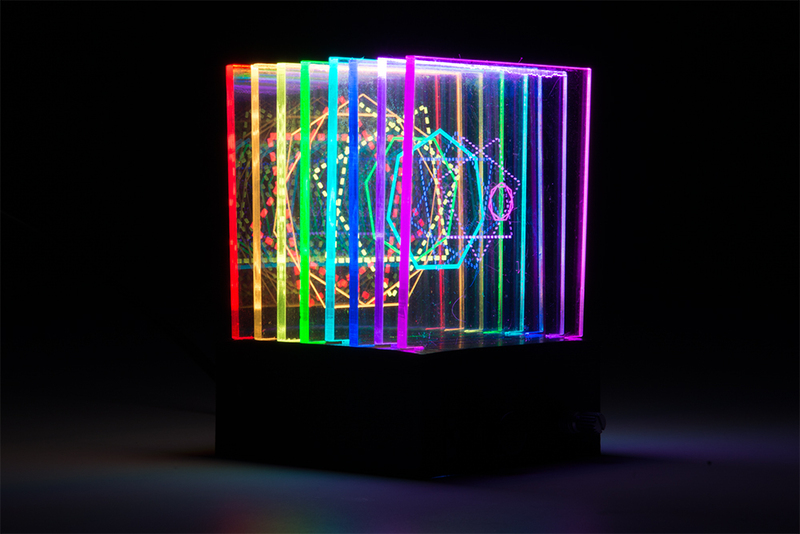 It utilizes the Adafruit Neopixel Library. I hope you enjoyed this project! 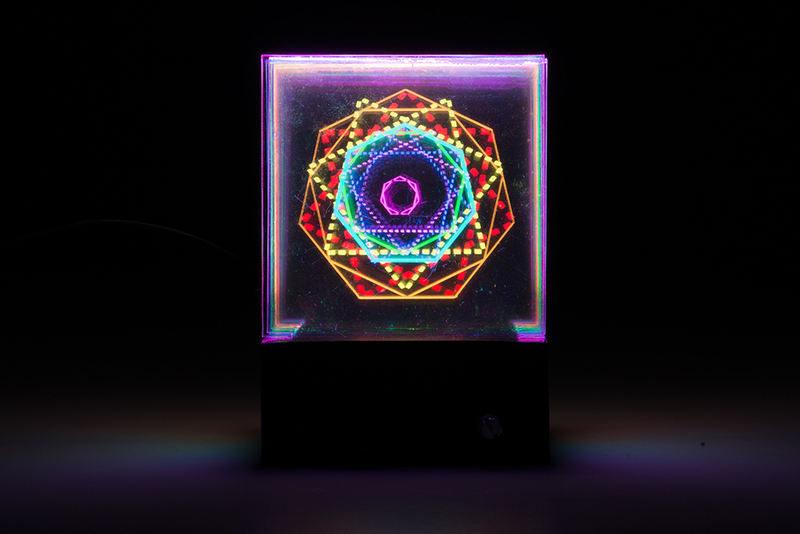 It was a lot of fun to make and I'm excited to continue building out the program for more LED colors, as well as making different designs on the laser-etched acrylic. 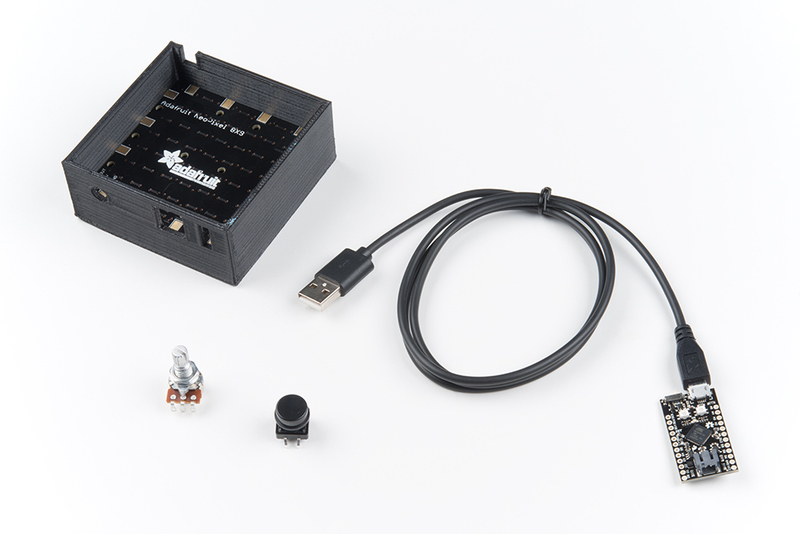 If you love this project and want to give it a go but don't have access to digital fabrication tools, try checking out your local library or maker space. If all else fails there are always online digital fabrication services from which you can order your 3D print and laser-etched acrylic. As always, please share your thoughts, ideas, and suggestions about this project in the comments below! At the risk of "over feature-izing" it, the thought occurs to me that you could set it up so that to "change" the "mode", you hold the button for, say, 1 sec., then each button push it goes to next mode changing which plate is illuminated, and once you've gone say 5 sec. without pushing the button, it drops from "set mode" to "playing" that mode. BTW, the two brightness control methods are not mutually exclusive. You could have both implemented in hardware, then you select "manual", "auto", or "both" (or even maybe "none") as a "mode". How about controlling the pattern based on the Qduino's analog inputs? 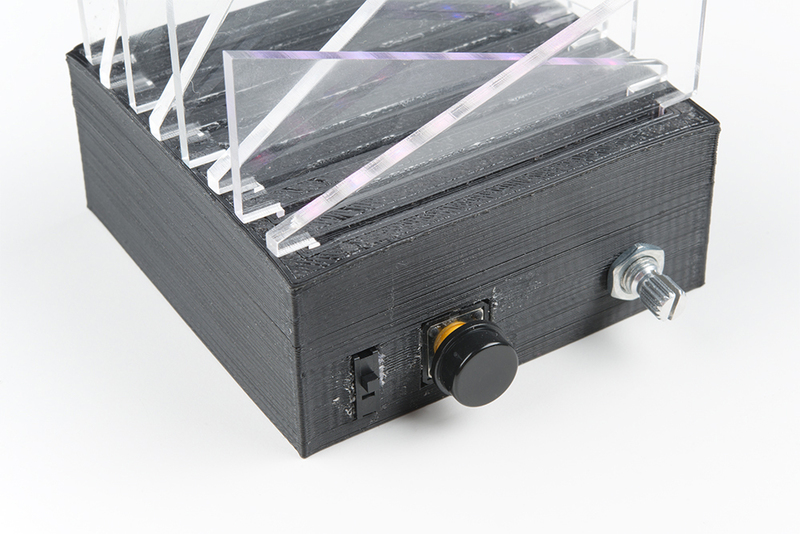 You could set up an acrylic light organ in no time. For your laser cut acrylic pieces, particularly the ones using the different shapes of acrylic (not the etched ones). Are the illuminated edges just the raw cut lines from your laser printer, or did you finish them somehow (like maybe a light sanding)?